Researchers find that even historical drought conditions could cause significant stress on the electricity system in the western United States. Regional power generation mix (circles) and electricity flows (lines) under “normal” and two drought scenarios Enlarge Image. Droughts reduce both hydropower generation and the generation capacity of coal, natural gas, or nuclear power plants that require water for cooling. When droughts coincide with high summer temperatures, which is when energy demand is typically highest, the electric grid becomes stressed and grid operations must deviate from normal to avoid unserved energy (i.e., blackouts and brownouts). 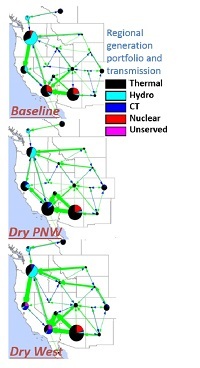 Pacific Northwest National Laboratory scientists used a combination of models and a new grid-centric metric for drought severity to demonstrate and quantify the impact of simulated historical droughts on grid operations. They also identified regional drought patterns that are associated with higher grid vulnerability. Why It Matters: Large-scale assessments of the vulnerability of electric infrastructure are usually performed for a baseline water year or a specific period of drought, but they do not provide insights into the full distribution of stress on the grid across the diversity of historical climate events. This paper describes a more holistic approach for estimating the distribution of stress on the grid by simulating electricity grid operations over the western United States during 30 years of water availability conditions. This is the first analysis quantifying the risk distribution of the grid vulnerability as a function of water availability. The combination of the distribution with the developed grid-centric drought severity metric can be used to evaluate and develop adaptation and mitigation scenarios. Methods: Scientists “softly” coupled an integrated water model (climate, hydrology, river routing, water resources management, and socioeconomic water demand models) to an electricity production cost model and simulated grid operations during August for 30 years of simulated water availability under historical conditions. Results indicated a clear correlation between grid vulnerability (unmet electricity services) for the month of August, when stress on the electric grid is typically highest, and annual water availability. There was a 21 percent chance of insufficient generation and a 3 percent chance that at least some electricity demand could not be met (i.e., that system operators would need to take steps—like invoking “load shedding” programs—to avoid a blackout or brownout). What’s Next? 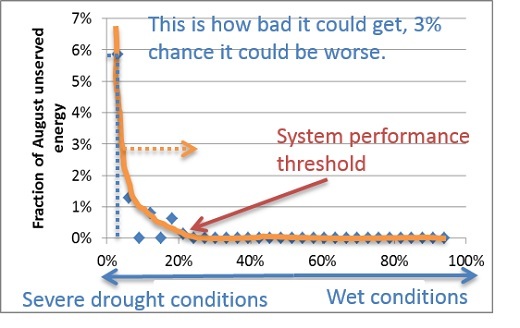 Better knowledge of the probability distribution of the risk exposure of the electricity system due to water constraints could improve power system planning. Deeper understanding of the impacts of regional variability in water availability on the reliability of the grid could help develop tradeoff strategies. Sponsors: The U.S. Department of Energy Office of Science, Biological and Environmental Research supported this research as part of the Integrated Assessment Research program for the Integrated Multi-scale, Multi-sector Modeling (IM3) Scientific Focus Area. Initial model development and data analyses were supported by the Laboratory Directed Research and Development Program at PNNL.